How does Google Analytics Integration work? We can automatically tag the links in your e-mails for Google Analytics so you can track what your contacts do on your website after clicking through from your e-mail. Please note that you need to have Google Analytics set up for your website prior to activating this option. You can activate this option & add the domains to track on the "Sending Newsletters" page under the "Configuration" tab. 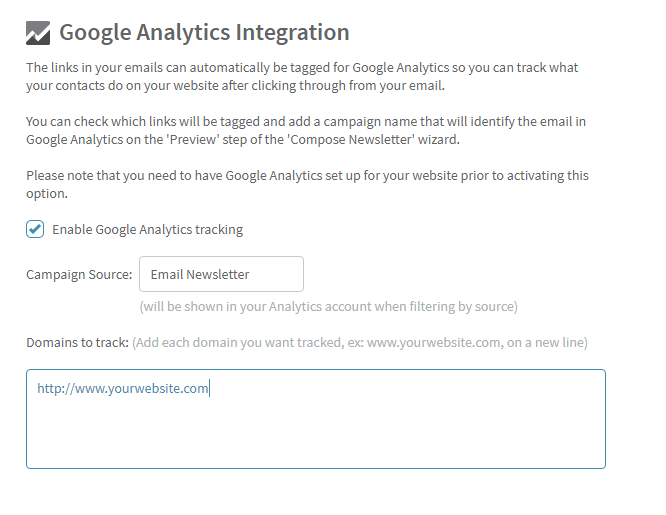 You can check which links will be tagged and add a campaign name that will identify the e-mail in Google Analytics on the "Preview" step of the "Compose Newsletter" wizard.